The landscape that surrounds Virginia Falls is timeless and dramatic. Among all the waterfalls of the world, it is a contender for the most beautiful. Located in the center of Nahanni National Park, the very first UNESCO world heritage site, Virginia Falls is surrounded by an astonishing 30,000 km2 of protected and rarely explored Canadian wilderness. The portage trail that connects the waterdome and the falls pools offers viewpoints which give spectators a new view of the falls at each turn. Sunblood Mountain towers over the falls making for cinematic views from below. 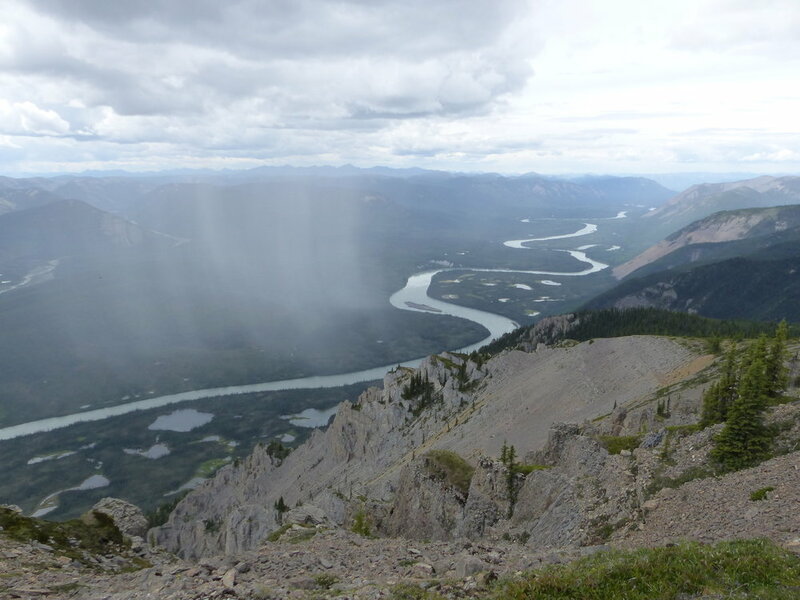 From Sunblood Mountaintop, hikers soak in a grandeur view of the ribbon of the Nahanni River from as far upstream as Rabbitkettle, and downstream beyond Direction Mountain. The ribbon of the Nahanni River. A major waterfall, think Victoria Falls on the Zambezi, can bring significant international attention, and with it high traffic levels. Due to its remote location Nahanni Wild guests have the opportunity to have their Virginia Falls almost to themselves. With less than 1,000 visitors each year, you’re will be sharing your experience with only those you will be travelling with. The Dené people who first knew of Virginia Falls appropriately named it “Nailicho”. In English this translates to “big water falling”. The 96 metre (315 feet) drop generates a thunderous symphony of natural wonder, a phenomenon that allows any who experience to reflect on their place in the universe. Its roar can be heard for kilometers, a song which echos into the vastness of the wilderness that surrounds it. Nailicho in the Dene language, Virginia Falls stands as the center piece of Nahanni National Park Reserve. This UNESCO World Heritage site is one of the worlds most celebrated wilderness areas. The geology of the Nahanni has shaped Virginia Falls and in turn the Falls have helped shape the surrounding wilderness, providing the impetuous for the Nahanni’s conservation. It is a mark on the landscape that has written it’s stories on the landscape that surrounds it. It is the most beautiful waterfall in the world.